I kept calling this place Le Petit Munchen for no reason besides the odd way that my limited French seems to effortlessly roll off my tongue in German-speaking countries. Weird. Small room, small bed, small bathroom, basic breakfast. 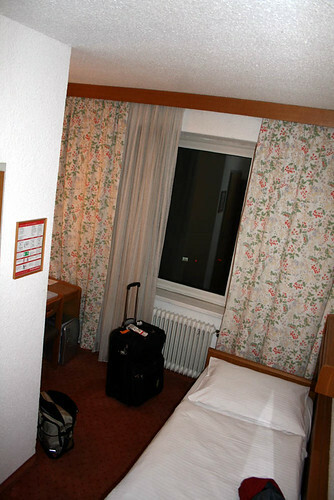 45 EUR/night ain’t much, but I was expecting something more. Big minus is the distance from the center of Linz, roughly 15 minutes by tram; two lines run from the corner of the hotel, so it’s convenient in that sense. Big plus was free wi-fi in each room. There’s a restaurant on the premises, basic Germanic fare. I’m never one to say never, but I shall (probably) not return. kleinmunchen-linz, originally uploaded by pirano.